The level of competition farthest away from the Major Leagues – in both distance and experience – is the Dominican Summer League. In their 14th season in the rookie-level league, the St. Louis Cardinals organization took a different tack. Because of two-year penalties imposed on the by MLB for their record spending on the 2016 July 2nd class, the Cardinals had far more international cap money than they could spend. Limited to a $300,000 maximum bonus per player, the organization bet on quantity, signing enough teenage free agents to roster an entire second DSL team in 2018. So the new club, DSL Cardinals Red, could share the same Baseball Oasis facility with the incumbents, renamed DSL Cardinals Blue, the two were placed in different divisions in the five-division, 44-team league, with the schedule arranged such that one team was always home and the other on the road. With a different formula than past DSL Cards clubs – offense first – both teams had a successful 2018, with the Blue team bringing home their division title. Though the Blue lost in the first round of the playoffs, it was the Cardinals organization’s first-ever first-place finish. Not only was the Blue’s .708 winning percentage the Cardinals’ best-ever in the DSL, it is the top mark anywhere in the organization since the 1976 Johnson City club came in at .714 (50-20) – until matched by the 2018 Gulf Coast League Cardinals at 40-16 (.714). The Cardinals Blue were equal opportunity winners, going 24-12 on the road and 27-9 at home. Even so, the defending league champion Twins played step for step with the Blue, finishing just one game out. With no wild cards, it was a tough end to a great season for the Twins. The difference with the Red was their 16-20 away mark, while they also were very good at home, 24-11. By the final month, it was clear the Rangers2 would win the division, but the Red kept playing well. Both DSL clubs were in a strange place for Cardinals teams at any level. The pitching was firmly in the bottom half, with top-scoring offenses leading the way, at 6.9 and 6.5 runs scored per game. The DSL plays under a different calendar than other short-season leagues, opening their 72-game schedule at the start of June and finishing in late August. To ease travel, each team played exclusively in its division. Series were always of two-game duration – one at home and one away. That meant three series per week with Sundays off. Blue manager Fray Peniche, in his eighth year, and his staff got the club out of the gates fast, winning 11 of 14 on the way to an 18-7 June. They began July in a mini-slump, going 4-5 before reeling off a nine-game winning streak in mid-month, finishing July at 16-9. August winning runs of eight and six games powered the Blue to their best month, at 18-5. However, the Rangers1, winner of the North Division, took their best-of-three semi-final series in two games, which the Blue each lost by just one run. As a result, Blue’s only three-game losing streak ended their 2018. The Red club, under former hitting coach promoted to Red manager John Matos, took longer to find its footing. By mid-June, a six-game losing skid left them with a 4-10 record. However, they went 9-2 the rest of the way to salvage a 13-12 first month of existence. The Red team continued to be consistently better than average, going 15-10 in July and 13-10 in August to finish a respectable nine games over .500. Prior to Blue’s success in 2018, the DSL Cardinals’ best year had been the .634 club of 2016, one of just three prior Cardinals second-place finishes in 13 years in the league. Not to diminish the Red’s record, either, as their .563 winning mark was better than 11 of the 13 prior DSL Cardinals entries. Here are the earlier DSL Cardinals records by year. Prior to 2016, the DSL Cardinals had relied in large part on pitching. Truth be told, the major downturn in mound effectiveness actually began in 2017, with the offense taking a more prominent role. That went to a new level in 2018. In 2017, the team ERA was 4.50 after three years of club marks around 3.50. As the table above noted, the Blue pitching recovered part of that gap, coming in at 3.93. On the other hand, the new pitchers on the Red squad struggled to a team ERA barely under 5.00. Only four of the 44 DSL pitching staffs had a higher ERA in 2018. Both Cardinals clubs were worse than the DSL league average team ERA of 3.83. In terms of baserunners allowed, with walks plus hits per innings pitched, WHIP, used as a surrogate, the Cardinals clubs placed in exactly the same ranking as their ERAs, 26th and 40th, respectively. Blue registered a 1.401 mark and Red limped in at 1.596. The league average is 1.370. Before I am too hard on the Red staff, it needs to be highlighted that they averaged just 17.7 years of age, which is the youngest in the league. At 18.4 years of age, the Blue was right on the league average. In strikeouts, the Cardinals pitchers were more impressive, at 16th (Blue) and 20th (Red), respectively. Both were just above the league average. Not surprisingly, the youth of the Red staff showed in their seventh-highest walk total. The Blue did well with the 11th-fewest free passes issued. That was better than the 19th-most showing in 2017, but close to the ninth-fewest result the year before. In terms of age, both the Cardinals Blue and Red hitters’ average age of 17.6 ties them for 21st-youngest roster in the league. That is just a tick younger than the league-average age of 17.7. As noted above, the Cardinals offense had a spectacular showing, ranking no. 1 (Blue) and no. 2 in scoring. That is a considerable improvement from the 13th-place showing a year ago. In batting average, Red was tops at .273 with Blue third at .268, with both substantially better than last year’s .255. The league average was just .237 this year, with two entire teams batting under the Mendoza line for the full-season. The Cards were again first and second in the league in doubles, with Blue on top. In home runs, the Blue was third with 40 long balls, but the Red’s team total of 21 was right on the DSL average. Despite the lofty offensive numbers, the Cards hitters were very patient, finishing seventh (Red) and eighth (Blue) in walks taken. That helps to translate into strong OBP. Red is third at .375 with Blue fifth at .369. Though they reached base often, the Cards were not basestealers. Blue came in 39th with 76 bags taken. Red was somewhat better at 29th with 91. The league average 107. In terms of success rate, Blue was at 68.5 percent and Red came in 65.0 percent. Neither great, nor terrible. In three-base hits, the power in the bats overcame the apparent lack of speed with respective third (Blue) and sixth-place (Red) rankings. Their three-baggers total of 46 and 40 compare to the league average of just 28. Putting it all together, in OPS, the Blue were no. 1 at .791 with Red a solid fourth at .768. The Blue were 12th in fielding percentage at .959, but Red were just 26th at .953. The league average was .954. Stolen bases were not achieved as often against Cardinals batteries compared to the rest of the DSL. Blue’s 82 steals allowed is sixth-fewest, while Red gave up 95, 13th-fewest. Blue were more successful with a 41 percent caught stealing rate that was seventh-best, while Red nabbed just 28 percent, fourth-worst. The league average is 34%. After two Cardinals were named DSL All-Stars the past two years, the expansion to two teams led to three All-Stars in total. Not surprisingly, two are offensive performers – Sander Mora (Blue) and Joerlin De Los Santos (Red). Red pitcher Martin Cordova was also recognized. I will go into more detail on their exploits in the appropriate DSL Pitcher and Player of the Year articles ahead. By my count, the Cardinals signed 40 players during the signing period that began July 2nd 2017, with only 11 of them inking contracts before the 2017 season ended. The latter group included 2018 All-Stars De Los Santos and Mora. The other All-Star, Cordova, did not sign until this April. The most notable new Cardinal is the jewel of the July 2nd, 2018 signing class, third baseman Malcom Nunez, who quickly got to work. Despite playing just the final two months of the three-month schedule, the 17-year old Cuban still won the league Triple Crown. More on his exploits are certainly coming. As noted above, because of the overspending on the July 2nd class of 2016-17, none of these players could receive a signing bonus of more than $300,000 each. 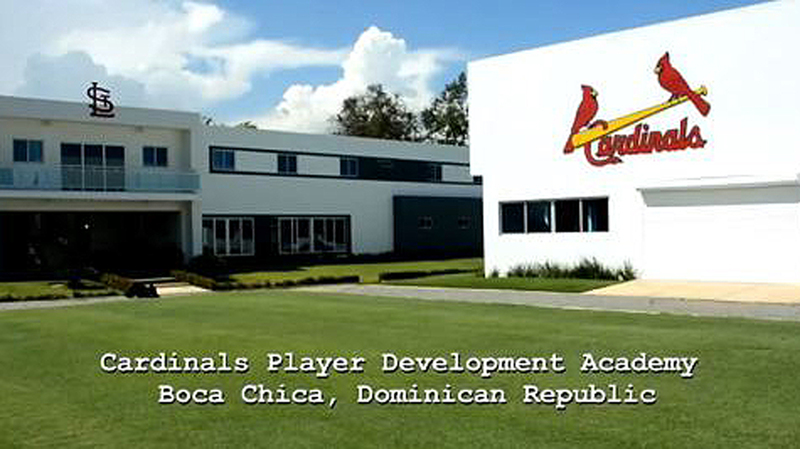 These young Cardinals should compete in the Dominican version of instructs, which usually commences at the Cardinals academy in October. Joining them will be the remainder of the 2018-19 international signees who have yet to appear in regular-season DSL games. Selected players will likely be invited to Instructional camp in the US in January. The offense-heavy DSL Cardinals Blue and Red will look to build on their 2018 experience and progress to another solid performance in 2019, along with graduating a number of standouts to play in the States. Link to master article with all 2018 award winners, team recaps and article schedules for the remainder of this series. Of course, that will include our selections as the DSL Cardinals Reliever, Starting Pitcher and Player of the Year.